To brunch: the act of eating all sorts of delicious sweet and savory food preferably with a bloody mary in your hand or a mimosa and almost always on the weekend, usually a Sunday. When I lived in NY all those years ago we used to do some serious brunching. Brunching that would last hours on end. First because you could never a get a reservation to the brunch spots that you wanted to go to so, you would wait at least an hour if not more to get in. Then the brunch would continue on for hours, because hey, it was Sunday what else are you going to do? Fast forward 8 years and I can probably count the number of times I have gone to brunch in the Bay Area. It is just not the culture here. Which is just fine by me - brunching always made me feel a little guilty because I was wasting a day. However and this is a big however I do love brunch food. But who doesn't really? When we first moved to Oakland I discovered Bartavelle Cafe in North Berkley and have been hooked on their breakfast ever since. It is not really brunch because I go at 9 am and no way does real brunch ever start before 11. Them the rules! Bartavelle Cafe is this tiny cafe smushed between a bread bakery and a wine shop. They have, in my opinion the best breakfast out there, namely their persian breakfast. What is a persian breakfast you ask? It is not your traditional brunch fare but am obsessed. I drive there just for that. 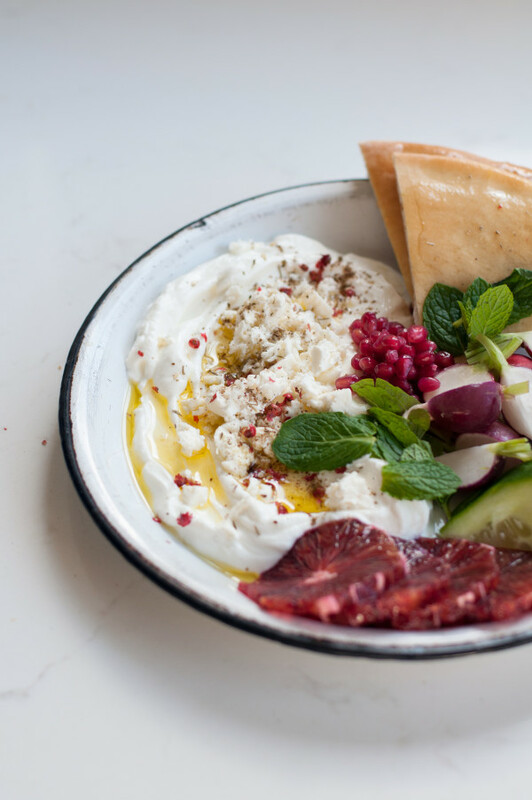 The dish consists of a big scoop of lebneh (think greek yogurt) topped with feta cheese, lots of herbs, cucumbers, a sweet fruit jam and served with fresh bread from the bakery next door. it is salty, sweet savory - basically everything one could dream of from breakfast. The idea of a savory breakfast is something new and I totally dig it. Who made the decision that breakfast had to be sweet? They approved eggs but everything else had to be sweet? No way - not my kind of breakfast. Maybe it means I am old but my ideal breakfast is savory and not just eggs but something a little more complex. This persian breakfast is everything I want and more. I decided to make my own persian breakfast so now I truly never, ever have to leave the house to go to brunch. The recipe calls for making your own lebneh which is a yogurt that has been strained so the consistency is thick and creamy (it is common in a lot of Middle Eastern cooking). If you don't have the time or patience to make the lebneh just use Greek yogurt. Combine yogurt and large pinch of salt together in a bowl. Pour yogurt into a cheesecloth lined strainer and suspend strainer over a bowl. Fold cheesecloth over yogurt and strain overnight or until most of the liquid has drained from the yogurt. 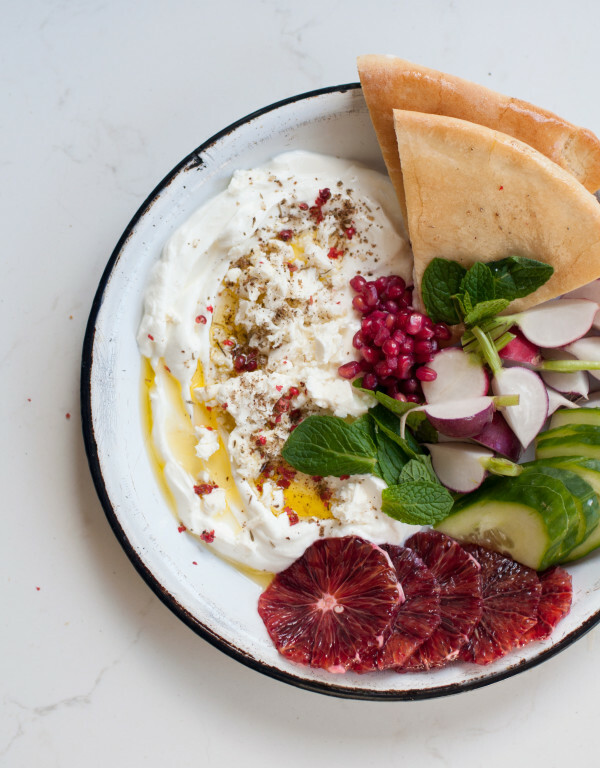 Serve lebneh with feta cheese, olive oil, blood oranges, z'atar, cucumber, radishes, jam, mint and fresh bread.